Welcome! 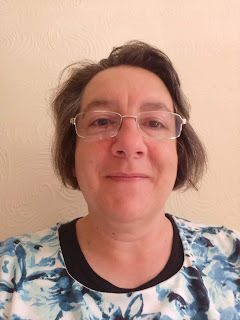 You have found the home of 'Being Me', Fran Hill's blog. Please browse my posts and if you like what you read, you'll enjoy my book 'Being Miss' which you can order from my website or on Amazon. My next book 'Miss, What Does Incomprehensible Mean?' will be published by SPCK Publishing in 2020. My website is at www.franhill.co.uk. Come and visit for more Fran info! It tickled me that the day after I posted saying, 'I won't be posting much' I get another follower. Is this because someone, having read my blog, found the thought of me NOT posting really appealing, so they joined up? Anyway, while I'm here, I want to show you this German who has won a world's best beard competition. His beard has a moose in it. I wonder if, somewhere, there is a moose sporting a beard with a German sculpted into it. I would like to see that picture very much. Talking about beards, I wrote a blog post once about Goldilocks and The Three Beards to show what harmy can be done just by adding another consonant to a word by mistake. If you can be bothered, it is right here. If you can't be bothered, you are perhaps tired and weary, so here is a nice picture of some fish for you to look at instead. They are kissing. Isn't that sweet? Hey, they think we're peaceful to look at. Hah! Look at them, peering in through the glass. Why don't you do your party trick? Okay, I will. On the count of three, okay? One. Two. Three. Turn! and the fish bowl in the shed. You are always entertaining, even when saying you won't be posting much, people laugh and follow! I find that beard very disturbing. 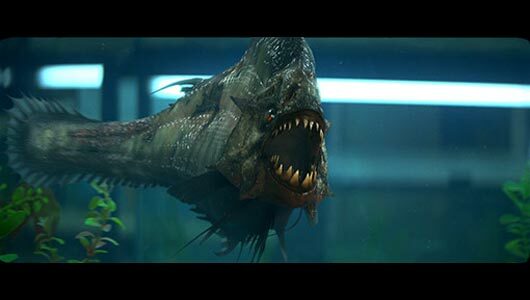 Moreso than the fish because I can't help but wonder if he sculpts his bodily hair. Your stream of consciousness is much more exciting than mine . Moose to bearded piranhas in thirteen lines . I like the one with the teeth, his beards not bad either. You have to keep posting. For one reason, you make me smile. 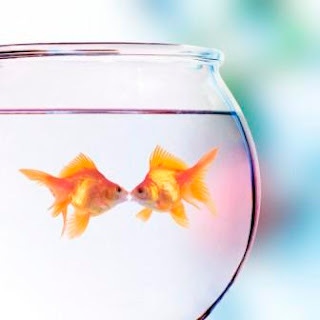 Fish kissing. And then Esmerelda. Who isn't Esmerelda sometimes? Maybe many times is more like it. I need to come over here more often. Have decided I will--to get away from it all and enjoy myself. "...and the fish bowl in the shed." The more I think about this and the "party trick"...Bahahaha! Are we sure it's a moose or an elk? If he puts fauna in his a beard species must be important! I heard about that man on the radio earlier & now I've seen his picture thanks to you. He looks older than 47 maybe he should shave off his award winning beard & be as smooth as baby's bum. I always think that I have nothing to Blog about & then something totaly random pops into my head. I have a friend whom I call 'fish'! Can you believe!!! ? lol! Yes that picture is surely sweet. A journey through your mind. Oh but we neeed you! You daft git! That made me laugh my head off - the bit where you got an extra follower once you mentioned that you weren't going to be posting as much! Is it just me? Is anyone else affected by the colours of food? I've just made an omelette for my lunch. On my days off (Mondays and Wednesdays) lunch is usually an omelette. I'm trying to avoid bread. We have fallen out, bread and I. I can eat most anything else and not put on weight. I have one thin slice of bread: suddenly I'm the size of a Juggernaut and can't get through normal doors. I reached into the cupboard for eggs for my omelette, pulling out a box of eggs that looked different from those we usually buy. 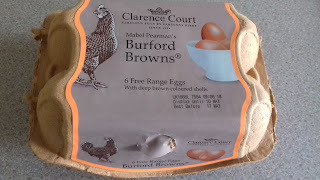 My husband bought them - they're called 'Burford Browns' and there's a message - I call it a warning - on the box: 'With deep brown coloured shells'. Fine. Deep brown coloured shells I can cope with. Who cares about the shells? They go in the recycling, to shell heaven. I picked up my new glasses this morning. Here's a Before and After comparison for you, whether you wanted it or not. I ignored its cheek and dragged it back down again. This time, it stayed. I broke a tooth the day before we travelled to the Lyme Regis holiday I posted about last Saturday. It was one of the big molars, right at the back, and already had a filling. And it wasn't just a crack - a large section of the tooth had snapped off and disappeared down my gullet masquerading as one of the cashew nuts I was guzzling indiscriminately at the time. So I feared the tooth was doomed. But I haven't had an extraction since my childhood. I wasn't sure what to expect. I decided to push my luck and see the dentist about it when we got back. 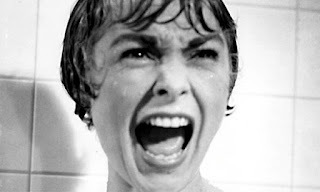 'Oh, heck,' said Anna, my dentist, this morning when I turned up for my appointment. This was after she'd looked in my mouth at the broken tooth, I hasten to add - not a negative reaction as soon as I poked my head around her surgery door. I'm a writer and English teacher based in Warwickshire and someone once asked me if I'd hurt my neck when this picture was taken. Recent review: Funny and easy to read, Fran Hill's 'Being Miss' charts the life of a teacher in a secondary school...in one day. The day is jam packed with unfortunate incidents and sharp, insightful descriptions. Beautifully written with a delightfully flippant narrator. Great fun!